Do you wish that your gate could automatically open and close for you so that you won’t have to get out of your car to manually handle the gate, especially when it is raining? We did, that is why we read many Mighty Mule FM500 reviews and articles about this gate opener to find out if it is really a good choice for an automatic gate opener. What makes the Mighty Mule FM500 the best residential gate opener? The Mighty Mule FM500 is one of the best driveway gate openers if your home has a single swing gate that is up to 18’ long and up to 850 lbs. in weight. It is an all-inclusive kit that you can easily install on your own with the help of the provided instructional DVD. This is produced by Mighty Mule, a brand known for producing different models of gate openers. They also produce different products related to gates to make it more convenient for owners to secure and access their property. The Mighty Mule FM500 is the best heavy duty mighty mule gate opener if you prefer something that is easy to install. It can also be easily connected to extra batteries and accessories. It may not be the best gate opener if you live in rainy areas unless you can find a way to better protect the internal parts from water damage. This gate opener is well suited for you if you have a gate that measures up to 18’ long and weighs up to 850 lbs. This gate opener is rated for heavy-duty work because it is applicable for gates that are at a maximum length of 18’ and at a maximum weight of 850 lbs. One of the best things about this gate opener is the easy installation, which is ideal for those who don’t have much experience in DIY. The kit includes the bolts needed to mount the opener in place so you don’t have to hire an engineer or a welder to install it. With the soft start and stop features, the gate opener automatically slows down as it fully opens or closes to prevent it from banging and prematurely shortening the lifespan of the gate opener. If you find this feature not useful, you can also choose to switch it off. The E8 gate opener is a good alternative to the Mighty Mule when it comes to DIY gate openers if you prefer to get another brand. Just don’t mix the brands because there is a great possibility that it won’t work. If you have dual gates, you may find the Mighty Mule FM502 to be the best dual swing gate opener which is very similar to the FM500. The Mighty Mule FM500 now retails on Amazon and comes with an 18-month warranty. 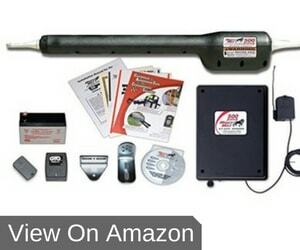 Replacement parts and accessories that can be used with the FM500 are available, so it is easy to repair or add even more features to your own gate opener. The Mighty Mule brand is related to the GTO brand and there are a few things in the GTO gate opener troubleshooting that may also be applicable to the Mighty Mule FM500. The GTO is known for producing heavy-duty gate openers and some are very similar to the FM500. With this Mighty Mule FM500 review, you’ll see that although it may have flaws, it is still a good product to purchase. We recommend this product because of how easy it is to install and to operate. We like that it can be used with other available accessories and that it can be powered by different sources.